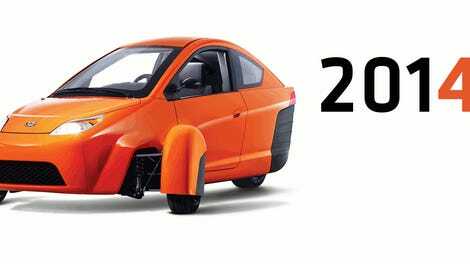 Elio Motors was founded in 2009 for an ambitious effort: bringing 3-wheeled, fully-enclosed trikes capable of achieving 84 miles per gallon to market for just $6,800. The company began taking “refundable reservation agreements” as much as $1,000 in 2013, for a debut on July 2014. Then the third quarter of 2015. Then mid-2016—right around now, actually. You still can’t buy one—but the company has spent years changing the laws in nearly every state in hopes that someday, you might be able to drive it. It’s been an ambitious effort. In 2012, just 11 states had provisions for “autocycles.” Today Elio announced that four years later, 30 more states have joined the fray, for a total of 41: Rhode Island and New Jersey were the most recent to set definitions for autocycles. Eight more states are reviewing their own legislation. If they do follow through, Elio will have paved the way to tap a non-motorcycling market across every state. An autocycle has a steering wheel, a conventional bucket-type seat, and no more than three wheels. It is fully enclosed. It would meet both car safety standards (anti-lock brakes, stability control) and motorcycle standards (lights, mirrors). The goal has been to make it so the owner would not need to spend the time and money obtaining a motorcycle license to drive one, nor would he or she have to wear a helmet: in a vehicle with crumple zones, a roll cage, three-point seat belts, airbags, and a roof, what’s the point? A roof is not always a requirement, however. In some states, an autocycle the Morgan Three-Wheeler and the Polaris Slingshot, but not the rolling-hairhat Can-Am Spyder—motorcycle-style handlebars disqualify it—would be valid to operate without a motorcycle license. (Such is the case in Pennsylvania, according to recently-proposed legislation.) The Campagna T-Rex, shockingly still in production, would count. This thing would count. If Toyota builds its i-Road, it would also be classified as an autocycle. So in 41 states, anyone with a driver’s license can drive an Elio now! The question now is: when can they?